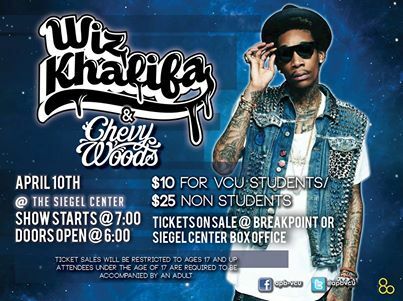 Tonight, the Activities and Programming Board will hold their annual spring concert- this year featuring the renowned Wiz Khalifa with Chevy Woods. To get you ready for the concert tonight- here’s a profile of the performers! Wiz Khalifa: Born in Minot North Dakota, but a native of Pittsburg, Pennsylvania, Cameron Jibril Thomaz, Wiz Khalifa is an Amerian Rapper, singer and songwriter. Wiz Khalifa has been active since 2005 and has worked with Rostrum Records, Taylor Gang, Atlantic Records and Warner Bros. Records. He is well known for his debut single for Atlantic; “Black and Yellow”, which peaked at number one on the Billboard Hot 100. Wiz Khalifa has won many awards, including BET’s 2011 Best New Artist, and the Billboard Music Award’s Top New Artist in 2012. He was also nominated for the American Music Award’s New Artist of the year in 2011 and Billboard Music Award’s top rap artist of the year in 2012. Wiz Khalifa was nominated for “Black and Yellow” for MTV Video Music Award’s Best New Artist in 2011. “Remember You” with the Weeknd won the Grammy for best rap/ sung collaboration in 2014. In April 2013, Khalifa revealed that after having his son he decided to work on a new album that he was planning to release in 2013. Last summer, he announced that his fifth studio album would be titled Blacc Hollywood and would be released in 2013. The album has tracks with Miley Cyrus, Adele and Juicy J. In February, Wiz Khalifa released the single “We Dem Boyz,” which is the highly anticipated hit that VCU students should look forward to hearing tonight. Chevy Woods: Kevin Woods, better known by the stage name Chevy Woods, is an American rapper from Pittsburgh, Pennsylvania. 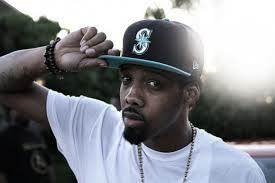 Throughout his career he has been heavily affiliated with rapper Wiz Khalifa and his Taylor Gang record label and tour. His first major appearance was on Wiz Khalifa’s song “Taylor Gang“. Since then he has released various mix tapes such as The Cookout with Khalifa and the Gangland series. In 2013, Wiz Khalifa released “Medicated” ft. Chevy Woods and Juicy J in the album O.N.I.F.C, the second charted song with Chevy Woods. This reached 44 on US R&B charts. The Activities Programming Board (APB) typically conducts surveys in the fall to assist with selecting the genre for the spring concert performer. After this initial survey a poll is conducted to determine which potential artists students would be interested in seeing. “We gather the results and try to get the artist that was selected or one very similar. This year we were very fortunate to land Wiz Khalifa, who offered to bring Chevy Woods, an artist Wiz frequently collaborates with,” said USC&A finance officer, Julian Lipscomb. The show tonight stats at 7 p.m. in the Siegel Center. Doors Open at 6:00 p.m. Remember to have your VCU student I.D.